Gastroade is a Magnesium and Calcium supplement that also contains Aloe Vera and Kaolin to help buffer and soothe your horse's stomach lining and thus reduce gastric distress. Since 1983, the dedicated people at Cox Vet Lab has worked hard to provide you with proven and time-tested products. It is both an honor and a privilege to be in a position to develop new products to meet your needs. We use these products on our own horses so we want them to work as well as you do. Our labors have produced many new and exciting products that are much needed in the equine industry, some of which set the pace for the entire industry. Working with our staff nutritionist, chemist and licensed veterinarians, we are constantly looking for new ways to adapt the latest nutritional and physiological research from around the world. As a result of those efforts, we can produce new and updated products that are second to none in both quality and performance. Are These Products Really SATISFACTION GUARANTEED? Yes! All because of the wonderful results our line of products consistently produces! 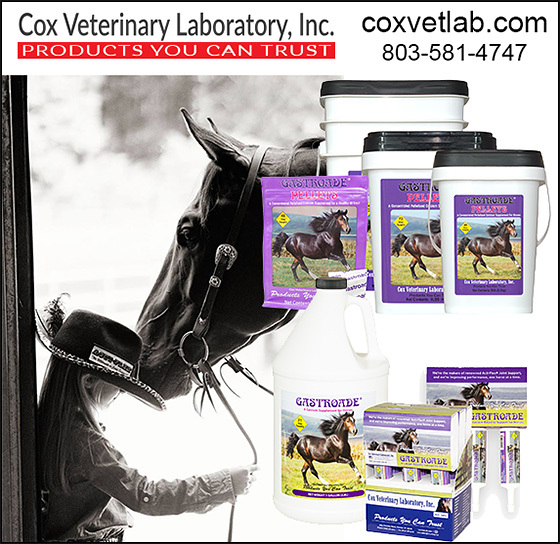 Cox Veterinary Laboratory products are fully guaranteed to meet your every expectation. We use these products on our own horses so we want them to work as well as you do. We offer a 100% satisfaction guarantee: If you are not COMPLETELY satisfied for any reason, we will gladly refund your money or replace the product. We only ask that you return the unused portion of product to us along with the original sales receipt so we can analyze the product for quality assurance. Is It True That Cox Vet Labs Uses The Highest Quality Ingredients Available? YES! We choose quality ingredients over lower cost ingredients because quality is key to the superior results we demand from our products. During the manufacturing process, we conduct quality control tests along the way on the raw ingredients as well as the finished products to ensure you are receiving a product that will perform as guaranteed. There are many symptoms from biting at their sides, laying back their ears when the girth is tightened, dull coat, irritability, loss of appetite, laying down after eating and more… check with your vet— but many MANY horses suffer from ulcers or digestive disorders. What Is Gastroade and How Can It Help My Horse? Gastroade is a liquid formula that establishes a new approach to dealing with equine gastric distress. Contains Calcium, Magnesium, and Aluminum to neutralize stomach acid. Aloe Vera, Kaolin, and Bismuth Subsalicylate are proven to relieve gastric upset by coating the stomach. Does Gastroade Come In Pellets? What Do Horse Owners Say About Gastroade? Where Can I Buy Gastroade By Cox Vet Labs? Well, of course you can buy directly from us at CoxVetLab.com— but we realize that sometimes buying from a catalog is convenient if you have other things to purchase. We are in many catalogs like ValleyVet, BigDee, SStack, PBSAnimalHealth and HorseHealthUSA. We strive to do everything we can to help your animals grow healthy, strong and to perform to their maximum potential by manufacturing products you can TRUST!